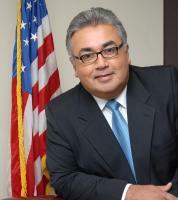 OC Political blogger Allen Wilson reported two hours ago that the FBI had raided the Capitol office of Senator Ron Calderon (D-Montebello). Matt Rexroad of Meridian Pacific notes ironically that Calderon represents the City of Bell in the State Senate. Though the warrants are sealed, multiple media sources have reported this is part of a wider federal investigation into public corruption in Los Angeles County. Calderon, who is termed out of the Senate in 2014, has committees open for the 58th Assembly District, currently represented by freshman Assemblywoman Cristina Garcia (D-Bell Gardens), and for State Controller. When Treasurer Bill Lockyer announced he would retire after the 2014 election rather than run for Controller (as we noted this morning on OC Political), Calderon’s bid for Controller got a big boost; this FBI raid likely cripples Calderon’s bid for controller. The office of Assemblyman Ian Calderon (D-Whittier), Charles Calderon’s son and Ron Calderon’s nephew, was not part of today’s raids. Today’s pair of raids are the first FBI raids in the State Capitol since the 1980s when the Shrimpscam investigation resulted in the conviction and imprisonment of Board of Equalization Member Paul Carpenter (D-Los Angeles), Senator Joseph Montoya (D-La Puente), Assemblyman Pat Nolan (R-Glendale), and Assemblyman Frank Hill (R-Whittier). Yesterday afternoon, agents from the Federal Bureau of Investigation served sealed warrants to search an office in the State Capitol and the Legislative Office Building. One of those offices was erroneously identified as an office of the Legislative Latino Caucus, based on an outdated roster of room numbers. The Legislative Latino Caucus moved into new offices earlier this year. Both offices that are subject to the sealed search warrants are the offices of Senator Calderon; one in the Capitol building and the other in the Legislative Office Building. This correction illustrates the limited information available to the Legislature. We have and will continue to fully cooperate with the agents. This entry was posted on June 4, 2013 at 8:08 PM	and is filed under California. Tagged: Bell, Bill Lockyer, California Latino Legislative Caucus, Charles Calderon, Cristina Garcia, FBI, Frank Hill, Ian Calderon, Joseph Montoya, Pat Nolan, Paul Carpenter, Ricardo Lara, Ron Calderon, Shrimpscam, V. Manuel Perez. You can follow any responses to this entry through the RSS 2.0 feed. You can leave a response, or trackback from your own site.